The Oil States In-line Tee (ILT) is an integrated equipment package that creates a branched line tie-in point along a pipeline. By creating a tee along the pipeline, the operator can plan for tie-in points to fit future expansion plans. The Oil States ILT system is integrated into a skid with necessary valves, lifting and support structures, mudmats and piping components. 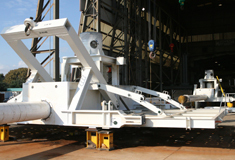 This facilitates simple installation into the line during launching and pipe-lay operations. The upward-facing hub can be attached to with an Oil States collet connector when future expansion is required. Economical, efficient tie-in point for future expansion as compared to a PLEM/PLET. Integrated unit with necessary valves, support and launching structures, and pipe components to facilitate installation. Designed to meet customer specifications for the pipeline, the installation vessel and tie-in parameters. Simple future connection with an Oil States collet connector.